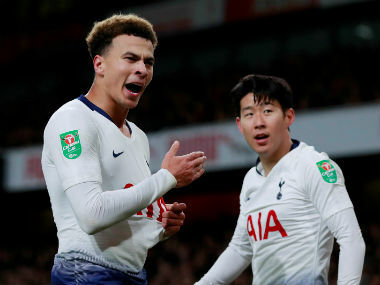 London: Mauricio Pochettino called for Arsenal to take "responsibility" after Tottenham star Dele Alli was hit by a bottle thrown from the crowd during his side's 2-0 League Cup quarter-final win on Wednesday. The England midfielder's decisive contribution provoked a disgraceful reaction from an Arsenal fan, who threw a plastic bottle that struck Alli on the back of the head in the 73rd minute. "It is what it is. It made the goal even sweeter, and the win," Alli said with a smile. But Tottenham manager Pochettino wasn't so sanguine about the missile throwing and demanded Arsenal find the "stupid person". "Yes I saw. When we play a derby we hate each other in a good way, but that looks in a bad way when you want to damage some people," he said. "One stupid person made a mistake. I respect the Arsenal fans. I hope that Arsenal take some responsibility. "Through the camera you can identify. It wasn't a problem but it could be a big issue. I think they will identify the people." There also appeared to be other objects thrown by Arsenal supporters into the section occupied by Tottenham's fans as the atmosphere turned toxic. The shocking incidents came after a Tottenham fan was banned for four years after being found guilty of throwing a banana skin at Arsenal's Pierre-Emerick Aubameyang when the teams met in an acrimonious clash earlier this month. It continued a worrying trend of fan behaviour after the recent alleged racist abuse of Manchester City's Raheem Sterling by a Chelsea supporter. Arsenal are scanning CCTV to find the culprit and Gunners boss Unai Emery condemned the incident, saying: "If there is one situation like this, it is not good behaviour." The unsavoury issues in the stands took the gloss off a mature Tottenham performance that underlined why Pochettino has been installed as the bookmakers' favourite to succeed the sacked Jose Mourinho as Manchester United's next permanent manager. 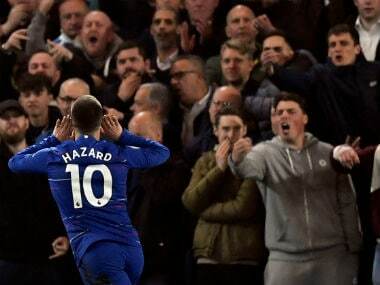 Eden Hazard came off the bench to score Chelsea's 84th-minute winner in their 1-0 victory against Bournemouth at Stamford Bridge. "Chelsea is a great team and it's going to be very tough but we are excited," Pochettino said. When Lucas Moura's aerial challenge deflected the ball into Alli's path, the Tottenham midfielder instinctively clipped a superb pass over the Arsenal defence. Aaron Ramsey was inches away from equalising when he met Alex Iwobi's cross with a volley that cannoned back off a post. Arsenal's profligacy proved costly as Pochettino's men turned up the heat after half-time. 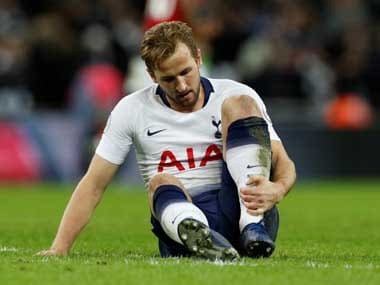 It was an inspired move as Kane played a key role in Tottenham's second goal in the 59th minute. Just 17 days after Arsenal's 4-2 Premier League win against Pochettino's team, this was a welcome early Christmas present for Tottenham.